At the age of 60 I still do not know whether a condition I have experienced since my earliest childhood is a problem for me or a benefit. Indeed, until a few years ago I assumed it was common to anyone who enjoyed music, and my suspicions that it might not be only arose when I noticed people had stopped reading newspapers on trains. There was a time when any railway carriage was full of people so deeply immersed in their daily newspapers that silence ruled. Conversations were virtually non-existent, whispered comments to neighbours occasioned a mass shuffling of papers as angry faces looked round to see who had broken the unwritten rule of silence, and only the intermittent cough was tolerated. I rather naively assumed the world was deeply absorbed in the affairs of the day; the political intrigues, the commercial gossip and the woeful deeds on far distant shores. Yet, almost without my noticing it, newspapers have gone. In those places where free-sheets are thrust at erstwhile commuters there is a choking mass of discarded paper littering the seats and luggage racks where they have been curiosity glanced and immediately discarded, but I cannot remember when I last saw anyone on a train reading a newspaper which they had actually paid for. The newspapers have gone, and railway carriages are no longer silent, but people still do not look at each other or communicate with their neighbours in anything more than an embarrassed whisper. Today’s commute is accompanied by the irritating beeping of text tones on mobile phones and the wheezing of noise-leaking earphones (not to mention the incessant on-board announcements) while, in place of newspapers, just about every passenger is wholly absorbed by the miniature screens of their electronic devices while their ears are filled with small speakers attached, usually by means of thin white leads, to a tiny device which seems to constitute the entire focus of their active attention. I realise that, far from nourishing a keen interest in world affairs, the newspaper was merely a means by which commuters could occupy their minds; as soon as something more entertaining came along, the newspapers went out of the window. This has made me realise that my condition is rare for, while I took (and continue to take) a keen interest in world affairs, I have never felt the need for any external stimulus to help pass the time on a journey. My condition is one in which my mind remains so fully occupied that far from craving some artificial means to keep it active, I positively resent distractions. I once mentioned my condition to some colleagues and, as if to confirm my suspicions, most could not begin to understand what it was I was experiencing. But one later conspiratorially took me aside to confess that he, too, suffered the same condition; “I was really worried”, he told me, “I always assumed I was a little abnormal”. The very fact that this condition affects so few people has led me to question what effect it is having on me. I am beginning to think that my chronic shyness, my inability to sustain conversations, my tendency to be dismissive in my comments and my total lack of small-talk are not the result of a badly flawed personality (which I had always assumed I had) but the side-effects of my life-long condition. And what is this condition? If it has a medical term, I do not know it (although it is perhaps related to synaesthesia), but the symptoms are easily described. From the moment I wake each day to the moment I fall asleep my life is accompanied by music. At any given moment during my conscious existence, there is music playing vividly in my head. The same piece rolls over and over again, not in its entirety but in little snippets which I can edit and replay at will, until another suddenly and unbidden takes over. On the few occasions when I wake in the night (I am a very good sleeper) the music is there, and in most cases its comforting presence helps rather than hinders me fall back into sleep. Often I have no idea what triggers off any particular piece of music; recently I have had Rimsky-Korsakov’s Scheherazade and Elgar’s Chanson de Matin, and regular visitors to the Rochester head concert are Franck’s Violin Sonata and Bach’s Double Violin Concerto. Sometimes I do not even know what the music which plays in my head is, and I can, with an act of extreme mental pressure, draw in any piece at will to take over what is already there. Usually, though, I just let the music play until its time is up. The matter has come to a head (if you will pardon the pun) since, for the last few days I have been totally unable to expunge the Duruflé Requiem from my head. I was at a conference in London over the weekend during which much music was played and much discussion about it pursued. 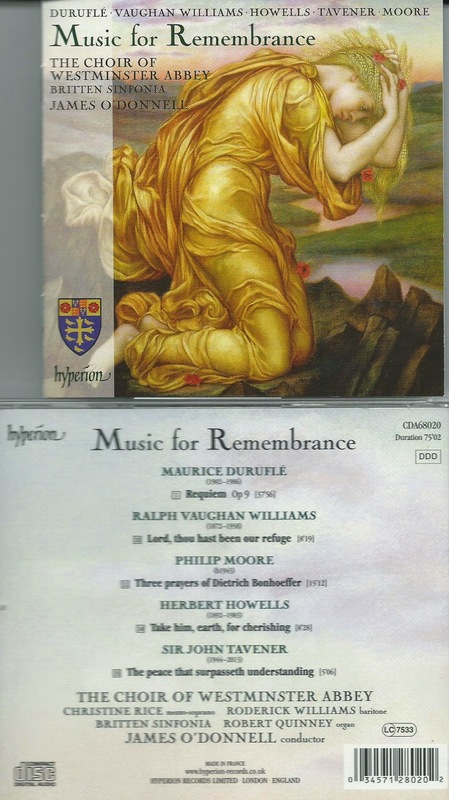 I listened intently to the music and joined in enthusiastically in the discussions, but as soon as there any kind of lapse in proceedings, up popped the good old Duruflé Requiem and off I went into my strange inner world. Coffee breaks saw me hiding in a corner dreading the attention of even my closest friends; so unwilling was I to let go of which ever movement had taken residence in my consciousness at the time; and when someone did come to talk to me just after the Agnus Dei had begun, I did rather brush him aside; which has ever since mortified me. I see him once a year; the Duruflé is with me all the time. I know what sparked the Duruflé off in my head. It was a new recording sent for review from the choir of Westminster Abbey and the Britten Sinfonia conducted by James O’Donnell. Not the best performance I have ever heard, but an exquisite interpretation of a work I have loved deeply ever since a revelatory performance of it my parents took me to in Guildford Cathedral way back in 1969. But while the new recording is truly lovely – I think it is among the most deeply beautiful recordings I have ever heard – what runs in my head is neither this recording nor the Barry Rose-directed performance of 1969. It is the work performed by the greatest choir and orchestra imaginable, in the most sumptuous sound and directed and interpreted as I want it; the music in my head is effectively my imagined interpretations rather than a mere echo of those I have heard before. The sad fact is, however, that while the Duruflé is playing away in my head and occupying so much of my conscious existence, I find myself becoming dangerously introverted, dreading the company of others and restricting my utterances to gruff and terse comments which say what has to be said in as short a time as possible. My face reflects the inner turmoil, passion, grief and joy of the music (thereby sending out entirely the wrong signals to those around me) and I’m not at all sure, from the strange looks I was getting from fellow-passengers on the Heathrow Express as I headed away from my London conference, that I wasn’t occasionally muttering the sombre phrase “Requiem aeternam” out loud, like some morbidly-obsessed deranged escapee from a secure institution. I know that a widely varied group of people read this blog. I hope that, among them, there will be a psychiatrist or two who can advise whether I need medical attention to rid me of this crippling ailment, or whether I am one in a million blessed with a priceless mental gift. At the age of 60, should I finally start to worry? One reason I enjoy reading your blog is that your postings often start off on one topic, and then circle round via various anecdotes to address a wholly different one. It is a most entertaining journey. This posting was a case in point, and you use a discussion of newspaper reading habits as the way into the main subject. Before commenting on that topic, I have to point out that the move to iPads and other mobile devices does not indicate that people are any less (or more) interested in current affairs now than they used to be (“affairs” is after all the only thing that many gossip magazines seem to address at all). A mobile device can allow someone to protect the world from invading aliens or massacring monsters, link to social networks or catch up on email; but just as easily it can be used for reading newspapers and magazines, books and academic journals, doing the crossword, or even to read your blog. And musical scores are easily downloaded from IMSLP and other places. The technology and the platform has changed, but for some the content has not. However, your main point was not about this. Are you are familiar with Oliver Sachs’ wonderful book Musicophilia ? It describes all manner of common and bizarre conditions relating to how the human brain handles music. Some disturbing, some quite miraculous. Constantly hearing music is one such condition, and he addresses one chapter to being “Haunted by Music”. I don’t know how common it is – but I and at least three other members of my family have this to a greater or lesser extent. Apparently it can vary from hearing single lines to hearing whole orchestras, from hearing a theme repeatedly to hearing whole works, and having a greater or lesser amount of control over what is heard. If I remember correctly, Sachs mentions some people who hear entire works against their will - as though an orchestra were playing uncontrollably inside their head, and others who hear works that they cannot recognize at all. He leaves the question open as to whether this condition is a blessing or a curse, a gift or a handicap – but he mentions cases where people have lost this (e.g. through stroke, accident, illness) and they find the silence far harder to handle. Likewise, the prevalence of synesthesia (at least two members of my family have this, though I don’t), is unknown because many people that have it do not question why, and are not aware that others don’t. There are also similar “gifts” linking numbers, words, and symbols with sounds and smells which can occasionally lead to truly remarkable mental abilities – for instance extreme mental mathematical ability, photographic memory and so on. If you have not read it, then I strongly recommend Sachs’ book. You can even download it onto your iPad, to complement the Durufle on a long train journey. But whether it will be a source of interest, comfort, or alarm I cannot say. Shortly before I had children, I was given a friendly warning: “beware, kids don’t come with a volume switch”. Perhaps it is the same with music in the mind.